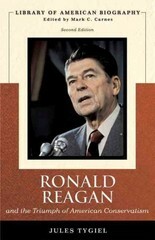 Ronald Reagan and the Triumph of American Conservatism (Library of American Biography Series) 2 Edition Jules Tygiel’s biography of Ronald Reagan engages students with the compelling story of the man who went from Hollywood actor to President of the United States. This balanced profile considers both the accomplishments and failures of Reagan’s presidency, as well as the contested legacy of his political career even after his death. Incorporating the latest scholarship, Ronald Reagan and the Triumph of American Conservatism examines Reagan both as an individual and in the larger context of the conservative movement. The titles in the Library of American Biography Series make ideal supplements for American History Survey courses or other courses in American history where figures in history are explored. Paperback, brief, and inexpensive, each interpretative biography in this series focuses on a figure whose actions and ideas significantly influenced the course of American history and national life. In addition, each biography relates the life of its subject to the broader themes and developments of the times.